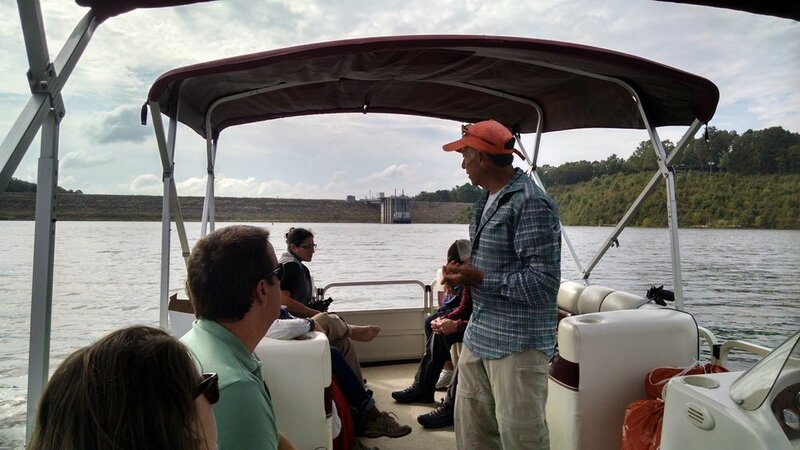 Encouraged by success of our first Public Awareness Pontoon Boat Tour last Fall with Durham County leaders aboard, we invited Chatham County participants for our second tour. Those aboard on the morning of Oct. 4 were Diana Hale and Karen Howard from Chatham County's Board of Commissioners; John Bonitz, Town of Pittsboro Commissioner; Rene Pascal and Dan LaMontagne, Chatham County Manager and Assistant Manager, respectively; Maria Parker-Lewis, member of Pittsboro Business Assoc. and Main St. Pittsboro; Greg Lewis, member of Pittsboro Business Association and Chatham Economic Development Corp.; Ilana Dubester, Hispanic Liaison, Siler City; Margart Sands, Outreach Coordinator, Triangle Land Conservancy; and Nick Cross, REI Outdoor Programs Manager, Central North Carolina. Captain Don Watkins of Triangle Boat Tours motored us from Vista Point to Jordan Dam. Along the way, the participants had wonderful looks at bald eagles, great blue heron and comorants in a setting undisturbed by a single house on the shoreline. But then we hopped off the boat to see an example of a "trashline" winding through the woods, impossible to see from the water. As happened in our Durham County Tour, the participants were eager to pick up trash. They filled two bags in just five minutes. We then pulled into a quiet cove (last photo) to sit for a brainstorming session on Chatham County could help us raise public awareness. Lots of great suggestions were offered including reach out to Chatham public schools; county-level messaging; invitations to reporters to view trash after storms like we just had and to be on board our next pontoon boat tour; reach out to upstream counties for our Adopt-A-Feeder Stream program; and appeal to shoreline fishermen with emotion grabbing photo of bird entangled in line imprinted on large sign.